Applied Ballistics has just announced Ballistic Performance of Rifle Bullets. This new book is chock full of “mission critical” data on hundreds of popular projectiles. This latest reference book from Bryan Litz contains live fire test data on 400 modern rifle bullets. The data pages contained in this book are similar to the 225 bullet data pages found in Applied Ballistics for Long Range Shooting. The Ballistic Coefficient data is based on live fire testing methods which are repeatable within +/- 1%. If you’re looking for “rock-solid” info on the ballistic performance of today’s most popular rifle projectiles, this work is the definitive print resource. Scroll down to see a sample page from the new book. CLICK HERE to see the full list of bullets covered in this new resource book. Visit the Applied Ballistics Online Store to pre-order your copy and save $5. Note: Pre-orders are expected to ship and arrive at USA destinations in time for Christmas. Retail price is $54.95, with a $5.00 pre-order discount. “Modern rifles have reached an unprecedented level of accuracy. In many cases, the weak link in the chain of hitting targets is the trajectory modeling, which is based on bullet performance,” stated author Bryan Litz. Unfortunately, shooters can’t always rely on advertised Ballistic Coefficients (BCs) being accurate. Slight errors in BC modeling can be the cause of missing your target. Furthermore, a meaningful apples-to-apples comparison of bullet performance is not possible when the BCs are determined differently by various brands. This book provides highly accurate ballistic performance data for 400 modern long range bullets from .224 to .408 caliber. By employing a common testing method for bullets of all brands, shooters are provided with consistent and accurate performance data which can be used to compare and select bullets, as well as to calculate accurate trajectories which put your shots on target at long range. It is claimed that the BC data is accurate (and repeatable) to +/- 1% for all bullets tested. Detailed stability data is also included which can be used to determine suitable twist rates for bullets in various environments. NOTE: This is a reference book which contains mostly data pages. There is a single chapter in the beginning which talks about how to use the data. For a more thorough understanding of the science of external ballistics, readers are referred to: Applied Ballistics for Long Range Shooting (2d Edition). Share the post "New Applied Ballistics Book Features Test Data for 400 Bullets"
Around the nation, Tuesday, November 4 is Election Day. There are dozens of key Congressional seats up for grabs this year. In addition, important gun issues are on the ballot in many states. Remember, every vote counts — you can’t complain about local, state, and federal policies if you don’t bother to vote. We hope all our readers take the time to visit their local polling places tomorrow. If you want to learn more about the upcoming election, and research the positions of candidates on gun rights issues, visit the NSSF’s GUNVOTE website. This resource highlights key U.S. Senate and House of Representatives races. The NSSF Election Guide allows you to browse state-by-state. There’s also a handy page with links to directories of local polling places for every state. So — do your homework and cast your vote tomorrow! State Elections — Time of Reckoning for Hickenlooper? In addition, the GUNVOTE site covers important Gubernatorial contests around the country. Here is a video about the Colorado Governor’s race. In 2013, Gov. John Hickenlooper signed tough anti-gun measures into law and has been trying to explain himself ever since. On Election Day, Colorado voters will decide whether Gov. Hickenlooper deserves another term in office. Share the post "Election Day Is Tomorrow — Your Vote Counts"
For AR Do-It-Yourselfers, we suggest reading Glen Zedicker’s book, the Competitive AR-15 Builders Guide. Following Zedicker’s New AR-15 Competitive Rifle (2008), the Builders Guide provides step-by-step instructions that will help non-professional, “home builders” assemble a competitive match or varmint rifle. This book isn’t for everyone — you need some basic gun assembly experience and an aptitude for tools. But the AR-15 Builders’ Guide provides a complete list of the tools you’ll need for the job, and Zedicker outlines all the procedures to build an AR-15 from start to finish. 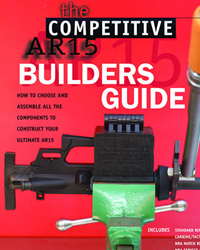 The Competitive AR-15 Builders Guide is not available from most large book vendors. However, Creedmoor Sports has plenty of copies in stock (item BK-Builder, $34.95). To order, visit www.creedmoorsports.com or call 1-800-CREEDMOOR. Share the post "Building an AR? Check Out Zediker’s Book Before You Start"